As computer devices have become such a part of our daily lives, it’s only natural that they become prone to human clumsiness. Good thing Logitech has come to the rescue with a new washable keyboard. for all the messy and accident prone online gurus out there. 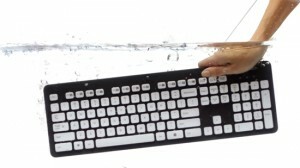 The Logitech Washable Keyboard can be hand-washed (not in the dishwasher) and can withstand being submerged in up to 11 inches of water. The number and letter keys are laser printed and UV coated, and has drainage holes on the back. It currently retails for $U.S. 39.99.